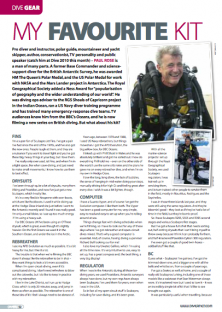 Pro diver and instructor, polar guide, mountaineer and yacht skipper, author, conservationist, TV personality and public speaker (catch him at Dive 2010 this month) – PAUL ROSE is a man of many parts. A former Base Commander and science- support diver for the British Antarctic Survey, he was awarded HM The Queen’s Polar Medal, and the US Polar Medal for work with NASA and the Mars Lander project in Antarctica. The Royal Geographical Society added a Ness Award for “popularisation of geography and the wider understanding of our world”. He was diving ops adviser to the RGS Shoals of Capricorn project in the Indian Ocean, ran a US Navy diver training programme and has trained many emergency-response dive teams. 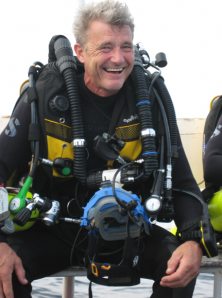 TV audiences know him from the BBC’s Oceans, and he is now filming a new series on British diving. But what about his kit? a tight space, like when cave-diving, and just need to make small movements, I know how to use them to best effect. at the Hodge Close inland site just before I went to the Antarctic recently and I found it was really good. I’m only a small bloke, so I use up too much energy if I’m using a heavy suit. For BBC Oceans UK I’ve been using an O’Three drysuit, which is great, even though it’s slightly heavier. On the first Oceanswe used it in the Southern Ocean, and under the ice in the Arctic. I use my APD Evolution as much as possible. It’s a bit heavy for me, but I like it a lot. The trouble is that when we’re filming the BBC doesn’t always like the rebreather to be in shot – hey want things to look a bit more accessible. When I’m open-circuit-diving, even if it’s complicated diving, I don’t need refreshers to blow out the cobwebs, but I do like to keep in practice with my rebreather. gave me on every rebreather dive, and when I’m on my own in Hodge Close. I love the long, long dives, the lack of bubbles, the sense of hanging in mid-water doing your stops, manually driving it for high O2 and feeling great after every dive. I wish it was a bit lighter, though. I have a Suunto Vyper, and of course I’ve got the Evolution computer. I like them both. The Vyper has been a good computer for me, very simple, easy to read and easy to set up when you’re rolling around at sea. Things change fast with diving schedules when we’re filming, so I have to look out for any of those days where I’ve got rebreather and open-circuit dives mixed. That’s why a good computer is essential. And, of course, having our great diving supervisor Richard Bull looking out for me! I also love my Uwatec Galileo, which I’m using all the time now. It’s very intuitive to use, easy to set up, has a great compass and, the best thing, a very big display! 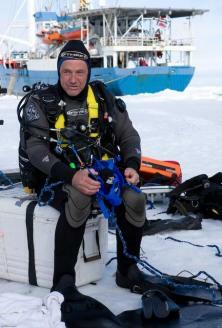 When I was in the Antarctic during all those ice- diving years, we used Poseidons. Antarctic surveyors always have done, but my own regs have always been Scubapro. I’ve used them for years, even when I was in the USA. So in fact all my open-circuit stuff is Scubapro, including for cave-diving, and it’s been great. With all the marine-science projects I set up through the Royal Geographical Society, we used Scubapro regulators. I was trained up in servicing them, and in turn trained other people to service them in the field, mostly inMauritius, Rodrigues and the Seychelles. I was in those three islands last year, and they were still using the same regulators. And they’re blimin’ good –they look as if they’ve had a lot of time in the field, but they’re bomb-proof. So I have Scubapro R295, S555 and R395 second stages and various Scubapro first stages. and half-knackered Poseidon Cyklon 300 regulators. I’ve even got a couple of good twin-hoses – oddball stuff like that. you could just you fold it up in your bag. face mask. In fact I only use the full-face mask for the telly. I've got loads of them, including a couple of those superbright Optoelectronics LED ones, which are brilliant back-ups. I've got a couple of really old Ikelite main lights which I love, with the big white batteries inside. I also have some old Dacors that I hardly use, but my favourite main lights are by Metalsub. I have a small Tekna knife on the back of my console, which I’ve had for about 25 years! always felt like they were moving a bit fast to me, and once you’ve let it go, it’s gone.